Sorry for the misunderstanding but when I said chapter I talked about anime not the manga.... I use chapter and episodes for both anime and manga. 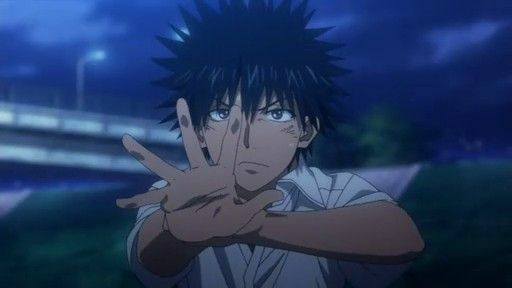 This time I meant anime I take as reference the "episode" 4 of Railgun when Touma officially appears =3=.... don't like his face from that screen shot. Well I'm not saying it's horrible animation inconsistency (I've certainly seen and put up with far worse), I'm only pointing what I believe Wilfri is talking about since some people didn't seem to follow. But if you pay enough attention, it's clear. Like I said, if you're paying enough attention to it, you can see the animation inconsistencies between the image I linked and the one posted. It's (pretty much literally) staring you in the face, lol. They both look like Touma to me, but it's all a matter of interpretation. My friend (who is an artist) has torn up drawings after working for hours on them because they looked "like a different person", but to me it looked perfect... since he can live purely on money made selling his art, I'm guessing he just can see something I don't... which is probably what is happening here. Now again, I'm not saying this is a bad thing; every anime needs to cut a few corners in the animation somewhere to stay in the budget. Bleach does it, Rurouni Kenshin did it, Gundam does it, Macross does it, and so do many many other animes with bigger budgets than Railgun and Index. I'm just pointing out that Wilfri was talking about animation inconsistency in the anime, since some people were thinking he was talking about comparing the anime's animation to the manga art. Remember that GAR mug of his a couple of episodes ago? Well THAT and THIS look completely different. THAT'S what's bugging me here. Meh. My philosophy is if I don't notice the animation quality before coming here and you guys spelling it out for me, it doesn't matter. Looking at the length of this thead, I guess the number of viewers has significantly dropped. Nah, it's just cause the whole 6th ep. is a fanservice episode for Mikoto lovers Not much to discuss here. Oversized signature, meet underfed bunnies. - This cake is great. But I don't think I could eat the rest of it by myself. - Want us to help you? - We'd be happy to take a piece. - Can you even digest it with your guts hanging out like that? Evidence for: Only a drop in ten voters from last ep. I'd have to agree with Cyrus17. Yep not much to discuss about this episode really thus it's only 5 pages. Characters voices are considered off topic, but I somehow caught a somewhat blunder from a change in Kuroko's voice on just one word. Misaka has a difference of opinion about judgement and Kuroko in a surprised state goes (in a much deeper or older voice) "oneesama". That was almost as humorous as her wild tangent shortly thereafter. So it's not just the drawings that can be inconsistent (that depends on who judges art or voices).